Weird methods or not (I don't know, either), you sure ended up with a great-looking chair! Way to go!! you sure cracked me up with the "coordinating furniture" comment jajaja. GREAT JOB! I love what you did with that sad little chair! Haven't been to Ikea in a while as we don't have one that's close, but I have to get my hands on a bit of that fabric. Well done, you! Love that chair!! Looks really great. I've always loved that fabric too. I think the chair looks delightful!! I love it! I have a chair you have inspired me to give a new face to. Love the way you recycled that chair! Awesome pattern and how green of you! WOW Love it ! I have a half re-furbished chair sitting in the corner of my lounge that i've bn waiting to find the right fabric for, too many choices!! 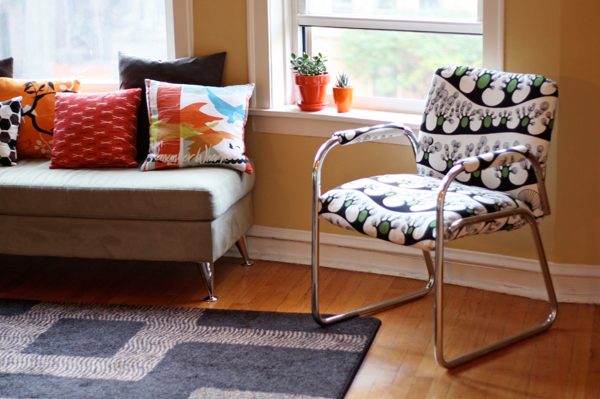 Loving the chair & the fun funky IKEA fabric. LOVE the fabric and the chair - it turned out great. 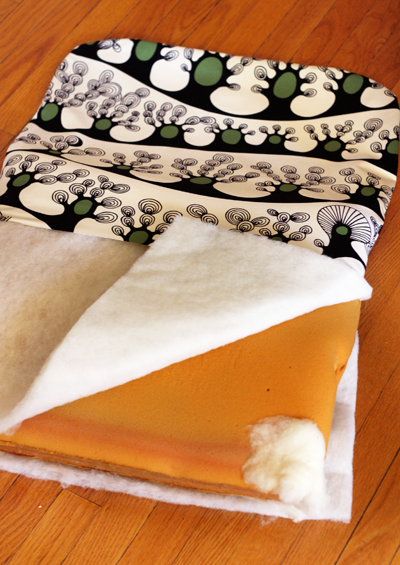 I'm sure there are professional methods to follow when reupholstering, but what fun is that? Your funky walker chair is great! I got the exact style chair for $5 at Goodwill this summer. It's in an orange wool and in pretty good shape but the arm rests are black plastic which really irks me. I'm thinking unscrew them and cover with some foam and fabric. Totally bookmarking this for the future! Your chair looks awesome! I saw one your fabrics, sewed as a rain drop cushion, on a french on line shop, and I was as proud as if it was mine ! Looks great, well done! And you are funny too - "This chair sort of reminds me of a walker, but I'm okay with that. When I'm 80, I'll have coordinating furniture" - ha ha! **, wow--this stuff has even made it to France. Fun! The chair is adorable! The new fabric totally transformed it. What a great chair and husband! ... he stopped to get you more fabric, what a great guy. I love that fabric. I'm curious to know how well IKEA fabric holds up . . . I used a staple gun I got at Home Depot. 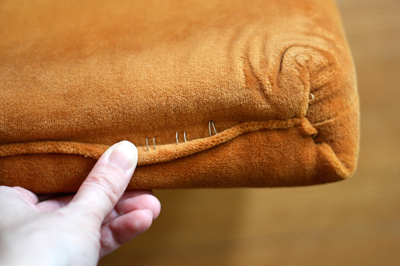 With regular staples, nothing special for upholstery. I used some 1/4" deep staples, and some 9/16" depending on where they had to go. I love the chair. The fabric you chose is just perfect. Oh my goodness, that chair rocks! When I was a kid my grandma had a beauty shop with chairs just like that, I love what you did with it! I love Jubilee! And your "new" chair! this is a great idea and the result is amazing! OK you got a great hands – I love the chair. I probably would not bother to fix anold chair like you but this one looks great!!! Adorable! I love the simplicity and versatility of it. Great job. Thanks for sharing! This is so inspiring! 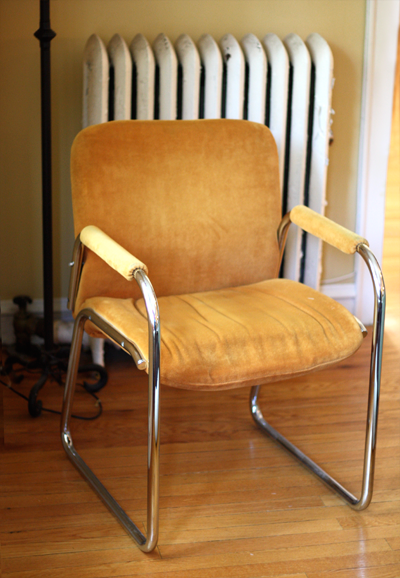 I am in need of a great side-chair so now I am amped to go thrifting. This looks amazing. Unusual methods or not, it looks really crisp and just awesome. Oh, how I wish I could sew better. You can be proud. I love the new look. 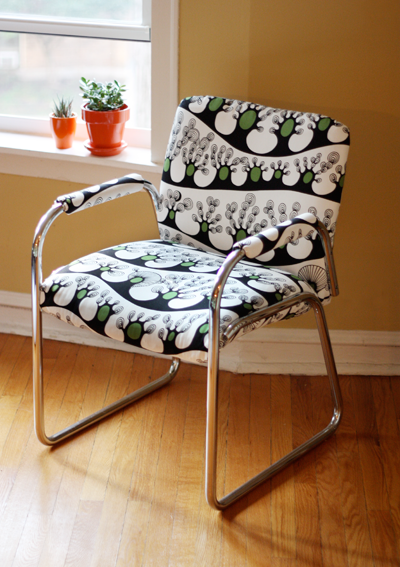 I am also thinking of buying IKEA fabric to prolong the life of a comfy upholster chair I have in my living room. Seeing yours encourages me to do it. Do it, Kim! Do it!